Vitalac is such a rare treat that it has been protected as immaterial cultural heritage in Croatia! Found only on the island of Brač and in one more village on Crete, Vitalac takes lamb's offal (liver, heart, lungs) skewered and wrapped. After turning on live coals, sticks are wrapped in lamb's intestines and then turned for another hour. Vitalac is then cut and eaten while the diners wait for the whole lamb to be baked. Starting from Split harbour, your journey continues across the hills of Brač to the tiny Škrip village, the oldest settlement on the island. After exploring its history, rural stone architecture and vivid traditions, continue to a konoba in the picturesque and wonderfully preserved eco village Dol. Your hosts have been running this place as a family business for years and preserve the old island times in many little details of décor, evoking memories of the times past. 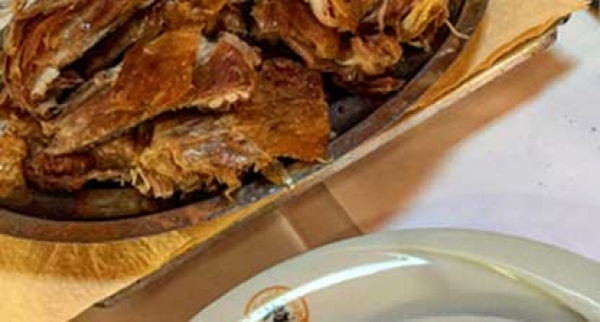 While savouring this authentic Brač setting, enjoy their stories, Vitalac and some strong local Plavac Mali reds, while watching your unique local delicacy, lamb on the spit, turn on fire! If traveling by ferry from Split, the departure time depends on the ferry schedule, hence there will be time available before the 4 PM ferry to do more sightseeing or hit the beaches. At an arm’s reach from Split riva, Brač reminds of a mythical rock in an embrace of pinewoods, mesmerizing you with scents of pure nature as soon as you set foot on its shores. Feeling like a million miles away from everything, Brač still reminiscences of the times when glagolithic priests settled here, escaping the Turkish invasion of the coast, giving rise to the monolithic village in the desert Blace with their monastery and observatory. At the far end of the island, near the famed Golden Horn sandy beach, Dragon’s cave will entrance you with its carvings in the rocks of the cave, a powerful tribute to the monastic life which once took place within its walls.